Happy Fourth of July week! Tomorrow we celebrate the signing of the Declaration of Independence and the freedoms we have with living in the United States. This is a time to enjoy friends and family, fireworks, parades and of course, great food. But for those dedicated to living an altruistic lifestyle, the Fourth of July can also be an opportunity to get involved and give back to our community. 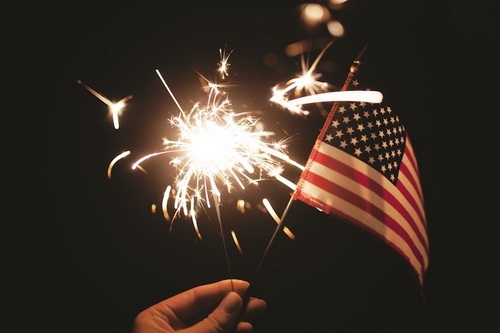 If you want to celebrate this Independence Day with an altruistic twist, check out some of these ideas for how you can give back to your community near and far. 1. Volunteer at a Fourth of July celebration. One easy way to give back this Independence Day is by checking out local parades, markets or celebrations going on in your community, then get involved! Can you help coordinate the parade? What about setting up booths for a Fourth of July market? Or how about putting together a fireworks show display stand to wow the kids? There’s lots of things going on nearby, and lots of ways for you to help out. See what interests you most and then volunteer yourself or your family for a Fourth of July you will never forget, because you spent it helping others. 2. Write a soldier a thank-you. Independence Day is a chance to honor all of the dedicated men and women who have given everything to protect and serve our country. This Fourth of July, you can personally celebrate our nation’s heros by writing a soldier a thank-you card for everything they have done. Are you having a backyard party to commemorate the day? Why not set up a card craft table for children and adults to write notes to soldiers? Then stamp them and send them off to make a soldier’s day, week or month. Or, for an added bonus, consider putting together a care package with all the necessities and luxuries our heros may be missing out on while away from home. 3. Get involved with a local shelter. Many people in your community probably don’t have the resources to celebrate the Fourth of July the way they would love to. See how you can help out by getting involved with a local shelter. Sign up to help serve food, put together a fireworks show or start up a cookout for a fun, philanthropic Fourth of July that serves others. Consider donating supplies to help celebrate the day. Have some extra fireworks laying around? Maybe an extra pack of hot dogs or bag of chips? See if it’s possible to donate them to families or individuals in need. Check out local shelters in your area to see what they need and the volunteers they’re looking for, then sign up yourself or your family to get started this week. 4. Invite and include a neighbor. Finally, honor Independence Day by inviting and including your neighbors around you. The Fourth of July celebrates a time when our country came together for a common purpose, so mark the occasion by inviting others to come together in your life. See if your neighbor next door has any plans for the day, invite a friend over for a meal or ask a family member if he or she wants to go volunteer with you. However you do it, get others involved in your festivities to have the best Independence Day ever. This Fourth of July, live an altruistic lifestyle by getting involved and giving back. Try out some of these ideas in your own life to see how you can have a fun, caring and kind Independence Day.